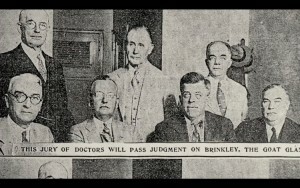 Actually the hearing concluded with the board members agreeing to come and watch Brinkley perform his goat gland surgery. Which they did. We couldn’t make that scene work here narratively, which is too bad, because it was quite something! It opens Pope Brock’s excellent book Charlatan, which you all should read.